Jars or other glass containers for fermenting. rock, small jar, or heavy object to place on top of the veggies. 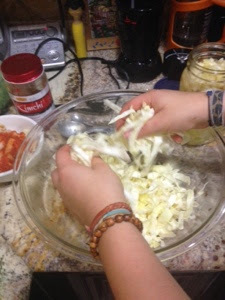 Add the salt and message it into the cabbage. it will start to break down and release moisture. this is good and what you want to happen. Let it rest for a bit so it gets really liquidy. 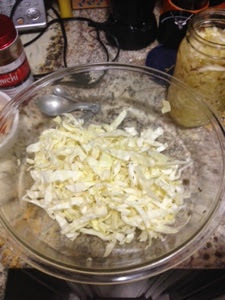 Add the caraway seeds and mix well. 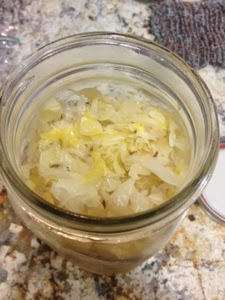 Move to a jar and make sure the cabbage is covered by the liquid. 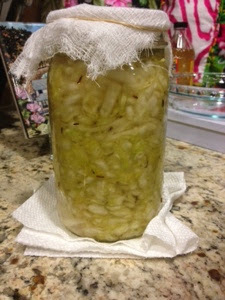 (this is where a rock or jar comes in to keep the cabbage submerged.